It started in detention. No surprise there, right? "For the past five years, Hayley Kincaid and her father, Andy, have been on the road, never staying long in one place as he struggles to escape the demons that have tortured him since his return from Iraq. Now they are back in the town where he grew up so Hayley can attend school. Perhaps, for the first time, Hayley can have a normal life, put aside her own painful memories, even have a relationship with Finn, the hot guy who obviously likes her but is hiding secrets of his own. Will being back home help Andy’s PTSD, or will his terrible memories drag him to the edge of hell, and drugs push him over?" I was expecting to love this one, and I did. Laurie Halse Anderson's writing is amazing, and this novel also had an excellent and heartbreaking plot and wonderful characters. I read it very quickly, and was just sucked in, oblivious to the outside world. The power of Anderson's writing is such that she has you laughing out loud in one moment, and then feeling like crying the next. Sometimes it's at the same time; you're laughing but you know you shouldn't be. I didn't necessarily feel that with Speak, but here, the writing was just that powerful. Anderson writes like a teenager, not like an adult trying to write like a teenager. Hayley's voice was so, so relatable and it felt so real; in fact, some of her thoughts seemed exactly like mine and in other respects her inner monologue seemed like people I know. She's so real as a character: bleak, cynical, humorous and poking fun at the system. Yet she's also deeply scarred. Some people on Goodreads said that they did not like her, but I sympathized and I loved her cynical voice, mocking the system and authority. I'm not sure how to express my love for this book. It was just so witty and wry and heartbreaking too. I have no experience with post traumatic stress disorder, so I don't know how realistic the portrayal was, but it certainly resonated with me. Hayley's father is such a scary character; on good days, he doesn't leave the house or do much; on bad days, he gets really drunk and angry. The result of this is that Hayley has to take on the role of caretaker, and it's very sad to see the roles reversed like that. Meanwhile, she's trying to deal with adolescence and everything else. It's all a mess of feelings and uncertainties. For example: "It [high school] was enough to make me want to flee into the mountains and live out my life as hermit, as long as I could find a hideaway that had a decent public library within walking distance and toilets that flushed...Then I'd see Finn in the hall, or I'd catch a glance of his profile out of the corner of my eye while we were driving to school, and he would turn to me and smile. And I didn't want to be a hermit anymore." I could definitely relate to the descriptions of the high school Hayley attends, with its horrible education system and population of brainwashed "zombies", as she refers to them. While I do think that it's unfair to just label everyone like that, anyone who says that there isn't an element of truth to it either hasn't attended an American high school recently or is a zombie themselves (sorry). Some of these people aren't bad per se; not at all. It's just that they're so entrenched in the system that it's too late for them to break out of it. I see this all the time at my school, and there are plenty of people there that are nice and all, they're just, well, zombies. That's not to say that all of these people don't have their own joys and sorrows and heartbreak, but to me it feels as if they're just acting out parts scripted for them by their environment, and I feel sorry for them. It's all so fake and contrived and stupid, and it makes me angry. And then there are the Rules that Hayley refers to for how things work, and the standards for different people. Perhaps I'm too judgmental, but it's really true. However, there are also plenty of people who defy the stereotypes; for example, the cheerleaders at my school are not all skinny as sticks, and some of them are quite intelligent. 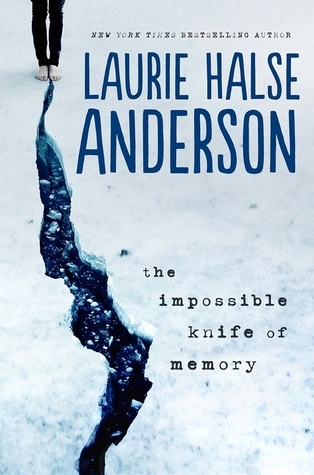 People are complicated, but Laurie Halse Anderson portrays them well. There are many YA books that have undertones of this one and other novels of her's, but they fail utterly at engaging the reader. (That was quite a digression on my part). Despite the fact that I loved it, the romance felt a little unrealistic to me; after all, Finn is somehow this really popular but really nerdy person who just sort of randomly takes an interest in Hayley, the dark, silent outcast. There's not really an explanation. The ending also felt rather rushed; it's really, really sappy, and I was not convinced at how everything got suddenly resolved. Not resolved, exactly, but how things with Hayley's dad went from an all-time low to getting better and better. Nevertheless, the ending appealed to me immensely and despite my criticisms I loved this novel. Even more than Speak.